Adrienne Cahill cares about three things: getting into a great college; becoming a revered journalist like her idol, Sydney Declay; and making her late father proud of her. So when Adrienne is offered the chance to write an article that will get her into her dream school and debunk her foolish stepfather’s belief that a legendary family of hermits is living in the Siberian wilderness, there’s no question that she’s going to fly across the world. But the Russian terrain is even less forgiving than Adrienne. And when disaster strikes, none of their extensive preparations seem to matter. Now Adrienne’s being held captive by the family she was convinced didn’t exist, and her best hope for escape is to act like she cares about them, even if it means wooing the youngest son. Adrienne Cahill finds herself on an expedition to remote Siberia looking for the fabled Osinov family with her stepfather, Dan, a scholar who is convinced he knows where this notorious family of hermits lives. Adrienne sees it as the perfect opportunity to write an article about her experiences—debunking Dan’s theories—and using it to get into her college of choice. I was hooked from the blurb and really, genuinely loved the book. BUT, I could never figure out why on earth Dan, among several other scholars, were so obsessed with finding the Osinovs. The family mysteriously disappeared thirty years ago to live in the wilderness away from society. (So what? Right?) I just couldn’t wrap my head around the obsession to find a family who obviously didn’t want to be found. Then the end of part one rolled around and I no longer cared about that little frustration. The book really took off at that point and I was obsessed with Adrienne’s journey. She was such a smart, strong young woman with a great sense of humor even in the worst moments of her harrowing experience. I appreciate how the author took pains to make Adrienne a normal teenaged girl who had no idea what to do or how to save herself, but at the same time, she had a tenacious spirit and a strong drive to survive no matter what. There was also a strange twist of a supernatural element that I was not expecting. The appearance of a little girl plays a significant role at key points throughout the novel. I didn’t love or hate this part. It was just odd for me. Like it wasn’t a completely necessary component of Adrienne’s story. 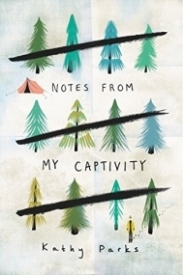 Even with a few frustrating elements, Notes from my Captivity was still a five star read for me. I would highly recommend this book to survival fiction fans of any age and Contemporary fiction fans as well.